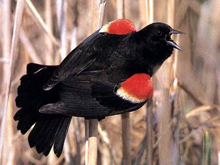 Male Red-Winged Blackbird (Agelaius phoeniceus) displaying during breeding season. On the morning after I saw my double shadow, I happened to pass between two male red-winged blackbirds, perched in two trees, one on each side of the path. They were engaged in vigorous negotiations regarding breeding territory. In such negotiations, they emit a call used specifically for these transactions, one I hadn't noticed before. I stopped to find the birds that were doing it, and I was rewarded with a fairly close-up view of this very display. You can learn more about their behavior from a video by the Cornell Lab of Ornithology, hosted at YouTube. Photo courtesy U.S. Fish and Wildlife Service. Making my way around the pond at dawn, this morning is a bit different from most. The pond is mirror smooth; the sky completely clear. Dawn turns into brilliant sunrise just before I pass a place where my shadow falls on a low bank to my West. I suddenly notice that I have not one shadow, but two. One is familiar, the kind you always see on a sunny day. But the second is strange — it's faint, and higher than the first. Eventually I realize that the sun casts the first shadow. The sun's reflection in the pond's mirror casts the second one. Such a simple thing, but I've never noticed it before. I wonder: what else in Life have I never noticed? What goes unnoticed can become seriously important at the least convenient times. Here are four questions that might make the unnoticed more noticeable. What is here that I don't notice? In the rush to get from wherever we are to where we're supposed to be next, noticing what's here right now often escapes us. We focus more on where we're headed than where we are. Take in your surroundings with all your senses. What's here right now? What do I think is here that isn't really here? Expectations can distort observations. We see things that aren't there. For example, it took me six months to notice that the postal service had removed a corner mailbox in my neighborhood. What assumptions are you making about your corner of the world? Have you tested them lately? What isn't here, whose absence I don't notice? we can fail to notice what isn't herefocus only on what's here, we can fail to notice what isn't here. For example, in a regular meeting where people engage in annoying sidebar conversation, the absence of sidebars might indicate something important. Noticing the absence of something requires imagining what can be, or remembering what has been, in spite of what is. Noticing what can be, but has never been, can lead to astounding innovations. What do I notice mistakenly in place of something that is actually here? Mistakes, misinterpretations, biases, and wishes can lead to noticing falsely one thing that isn't here in place of something else that actually is. When we experience fear and suspicion as a result of prejudice or superstition, we mistakenly notice what is not, instead of what is. Haste can cause errors like these. Bigotry can too. How many other sources can you find? Would you like to see your comments posted here? rbrendbjVgNQrWGDBJoHLner@ChacpOafxPYLvYBErDqSoCanyon.comSend me your comments by email, or by Web form. See also Critical Thinking at Work and Workplace Politics for more related articles. I offer email and telephone coaching at both corporate and individual rates. Contact Rick for details at rbrenCuBNdGMpEbvPKxAener@ChaceOwkrZqGdCbplSlIoCanyon.com or (650) 787-6475, or toll-free in the continental US at (866) 378-5470.